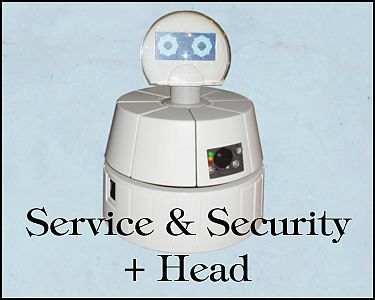 Techno-Cake home-security and service unit onto the base. The components allow the robot to signal the presence of smoke, gas, and intruders. Fitting the robot with a support attachment and plotter-device, the robot can utilize a humidity probe to detect water leaks. At the first sign of danger, it can inform a computer or trigger a built-in siren. Adding a head with big blue eyes makes it into a real human character. This robot is not yet available for photographs. A duplicate head and replacement slice will be made for one of my robots to replicate this version that may have never been produced by Sirius.